I decided to make some placemats for it; you know, for when guests come over and we pretend that we’re classier than we really are. I’ve been wanting to try Lion Brand Yarn’s 24/7 Cotton, and I had a hunch that placemats might be just the right project. Have you seen the color choices for this yarn? Beautiful! 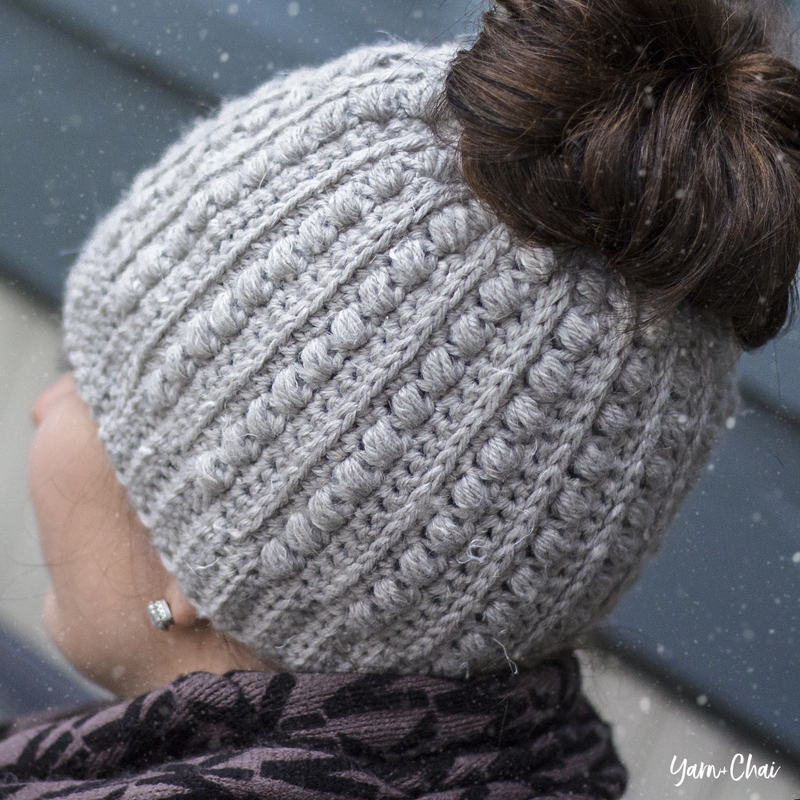 24/7 Cotton is a #4 medium weight yarn, although I’d definitely put it on the lighter side of the #4 family. It’s 100% mercerized cotton, which means it’s been treated with a process that brings out its brightness and sheen and helps it withstand multiple washings without losing that sheen. It comes in 186-yard skeins in a range of 24 gorgeous colors, from striking brights to natural-looking neutrals. It produces a stiffish (that’s probably not a real word) fabric, has a great balance of sheen and stitch definition, and doesn’t split at all during use. I’ve been seriously impressed with Lion Brand’s recently released yarns, and 24/7 Cotton is really no exception. With first color, CH 55. Helpful tip: The SCs in Rows 18 & 19 help us to create a nice straight line where color blocks come together. If we didn't add it, the color changes would have a more jagged edge. Thank you for creating this wonderfully nice pattern. Thanks to you, I just discovered great Christmas presents. p.s. Your dad did an awesome job! Thank you so much for allowing us to have some of your beautiful patterns. I thank you again. Thank you so much for this very beautiful and lovely pattern. You’re really lucky having a crafty dad, enjoy him!!! Love this! I am soooooooooooo going to make these for my breakfast nook table, in colors to exactly coordinate with my kitchen!! ? I made these placemats in white, red, gray, and black with Sugar n Cream 100% cotton yarn. They coordinate perfectly with my kitchen and breakfast nook. I cannot wait to make the Bubble Gum Accent Rug in the same yarn and colors to match. I wanted to attach a photo, but didn’t see an option to do so. That is cute!! The table your dad made you is awesome! I love farm tables! I recently have become addicted to Fixer Upper so I love everything farm related, haha! Hope you put pictures up of the table with benches when he’s done. Love your patterns!! OH REbecca, that table is amazing…will your dad adopt me… lool. The placemats are beautiful and really accent the table. The colors you chose I think are really good choices for the table. The place mat is simply stunning! The table is very beautiful, lucky you. Thank you for sharing wonderful pattern. Just want to say thank you for sharing your lovely pattern. 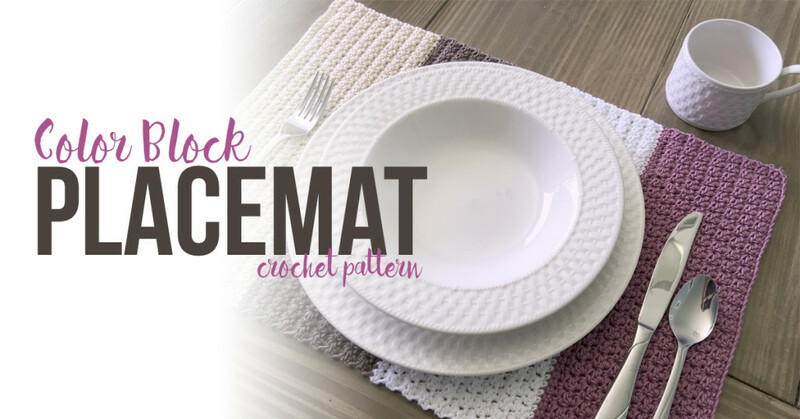 I have never taken the time to crochet placemats for myself, but I might now! ?? As always I’m a fan… i have made many of ur patterns. And this one is next, but the best thing about this blog, is the table ur daddy made u… how wonderful is this… my dad passed away may 24th 2015 @65 from stage 4 pancreatic cancer…. and I miss him like crazy…. Lovely place mats and table! I enjoy making your patterns and this particular stitch too. Thank you! I am a Mom of 3 ‘boys’ – 2 children and one husband 😉 – living in Western Germany. Keep on pls. posting all this lovely stuff you are creating ! These are beautiful. I have been looking for a good placemat pattern for a while and this is the one I will make! It is a simple pattern but I love the texture. Thanks for devising this one. Great placemats! Thank you for the pattern. I LOVE your dinnerware. Could you share the brand? Thanks! It’s the Gourmet Collection by Oneida, and the pattern is Wicker. I’ve had them for 10 years so I don’t know if they’d be available anymore, but I’ve always loved them! This pattern caught my eye in Pinterest. First-timer to your website and I am so excited to try out some of your wonderful patterns. They are just my style. Hi, I love the placemats unfortunately I don’t crochet. 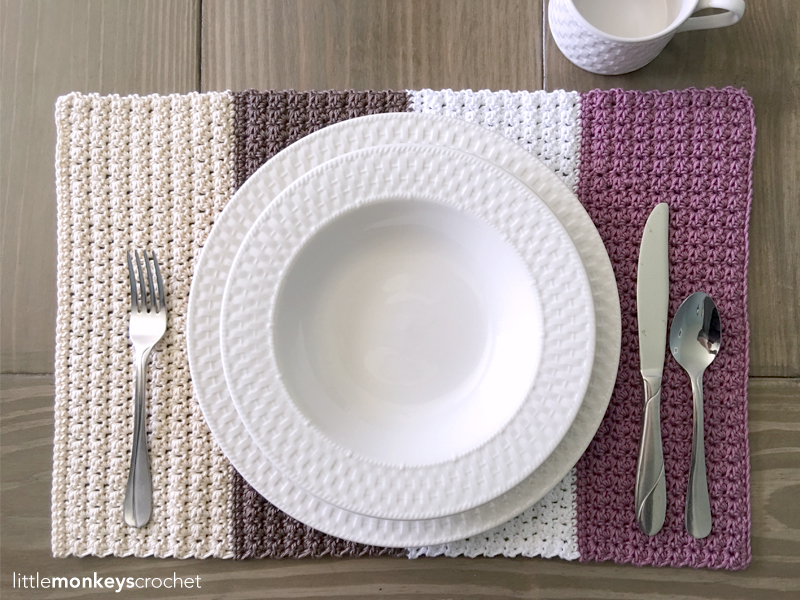 Do you have a pattern on how to knit those lovely placemats? That pattern sure is pretty. I’m busy making something else right now, but would love to make that in the future. These placemats are beautiful!!! I can’t wait to make some! Your dad did a fantastic job on that table. You lucky girl you can’t wait to see the benches he made for it. I love your ideas & patterns! I’m thinking of using the placemat pattern for sofa/chair arm covers. 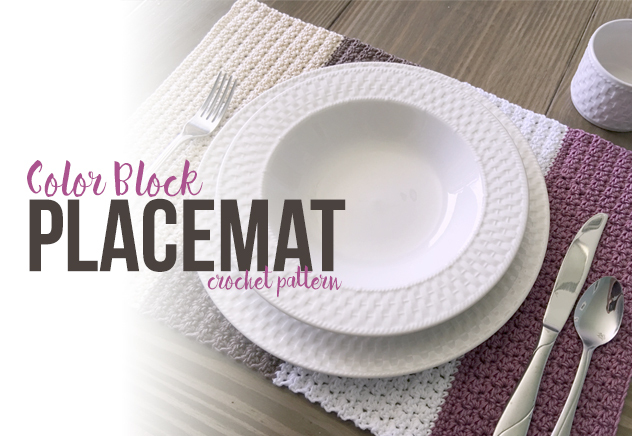 Question about the block placemat. In rows 2-17 if I skip stitch how does it still come out to 54 stitches. You’re skipping every other stitch, but you’re also putting two stitches in every other stitch (that’s what SC+HDC means), so it balances it out. I love this pattern and can’t wait to give it a try. Thanks! I am getting all my yarn together this weekend. I just have one question. Do you work these stitches in the last stitch or the whole entire stitch? I will appreciate anyones answer to this questions. If you do a single crochet, you have a front loop and a back loop, right? According to directions on how to do a hdc, they state, it should be done in the back loop. Does that make sense? What I am asking is do you do the sc and hdc through both loops? You do not specify if you work the sc and hdc through both loops. Thanks you for clearing that up. Now I can start. YIPPEE! I love this placemat but I guess I am the only one that is having a problem with it. At the end of Row 2 are there 3 stitches next to each other without a “skip” ? I have counted and recounted and I have 54 sso.Thank you for your help and for the pattern. Placemat patterns are hard to find. Rebecca don’t worry about your dining chairs not matching your table. Haven’t you noticed that todays’ designers are using ALL nonmatching chairs…My youngest daughter works for an interior design company and the designers there mix the chairs up a lot. Anyway, I love your table. You’re very lucky to have a Dad that can make things like that. 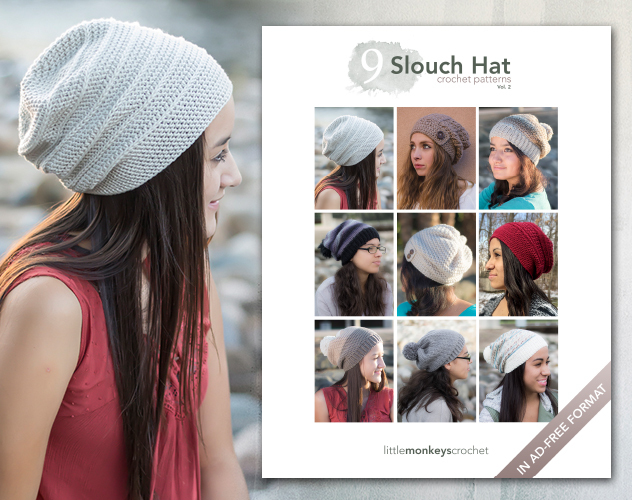 Sorry about the mix-up on the free patterns. I just didn’t understand . Thank you for the use of this pattern. looking forward to starting. I’m wondering about rows 2-17. Is it hdc, skip, sc/hdc, hdc, hdc, hdc, hdc, etc across? Or is it: hdc, skip, sc/hdc, hdc, skip, sc/hdc, etc across? You only repeat the sequence that is in the parentheses. So you will do that first initial HDC as instructed; that is not repeated at all. Then you’ll do the (SK next ST, SC+HDC in next ST) over and over again (SK, SC+HDC, SK, SC+HDC, SK, SC+HDC, etc) until one stitch remains. Then you’ll SC in that last stitch. Is there a video? Sorry I a new and videos help me out so much! Love this pattern! I loved this pattern but my parents wanted a thinner placemat. 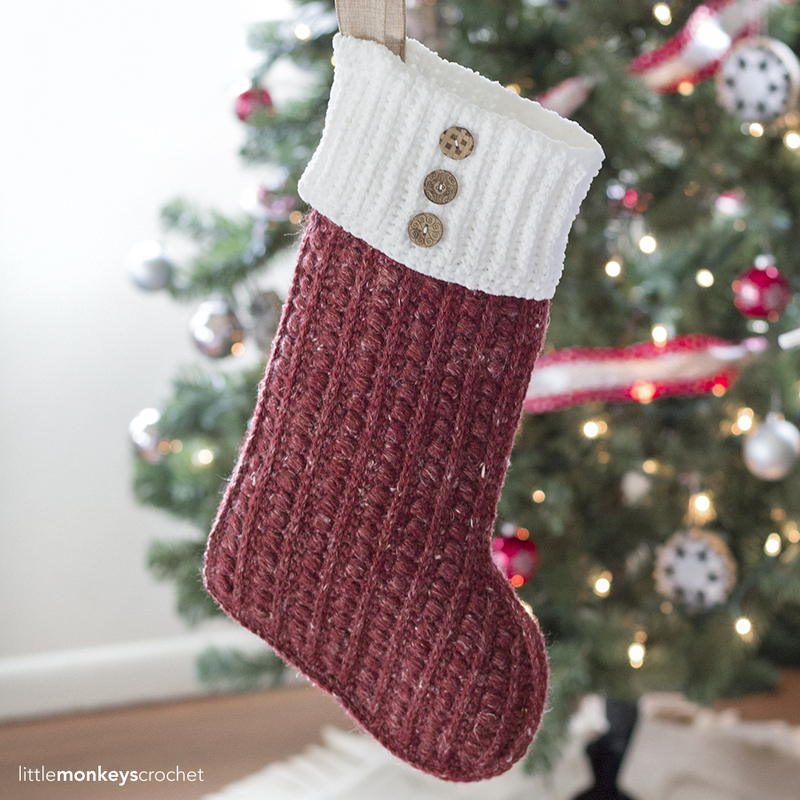 I used your instructions and used the moss stitch. Everyone that has seen the placemats want me to make them in their colors. I keep directing them to your website. Thanks for the pattern. I absolutely love these and can’t wait to start them. As a beginner, this is one pattern that I know I can do. I just ordered the yarn! Have been searching for such a project like this for a long time. Thank you. Pray and trust you and your family are well, especially the new addition. Bless you all. Hello!! I love these and want to make them for my mom! What are the names of the colors? I’m not sure which purple to use. Thanks for sharing the pattern! Thank you .. gorgeous placemats and your table is such a wonderful gift from your father’s hands. 1. If I block them, will they shrink or of back to original shape after washing & drying? 2. Should I wash & dry them before giving? Cold water – low heat…. before or after blocking? I have very limited experience with blocking as I never do it. I can tell you that my experience with Lily Sugar & Cream is that it stretches out and fades when washed. I love this pattern. I have followed it exactly the way it is written but I still have,13 more rows to go and the size of the placemat is already 19 by 14. What in the world did I do wrong? I’m so discouraged, this was suspose to be a gift and it’s huge. Help. Did you do a gauge check? And can you tell me what yarn you’re using? Hi, Rebecca! 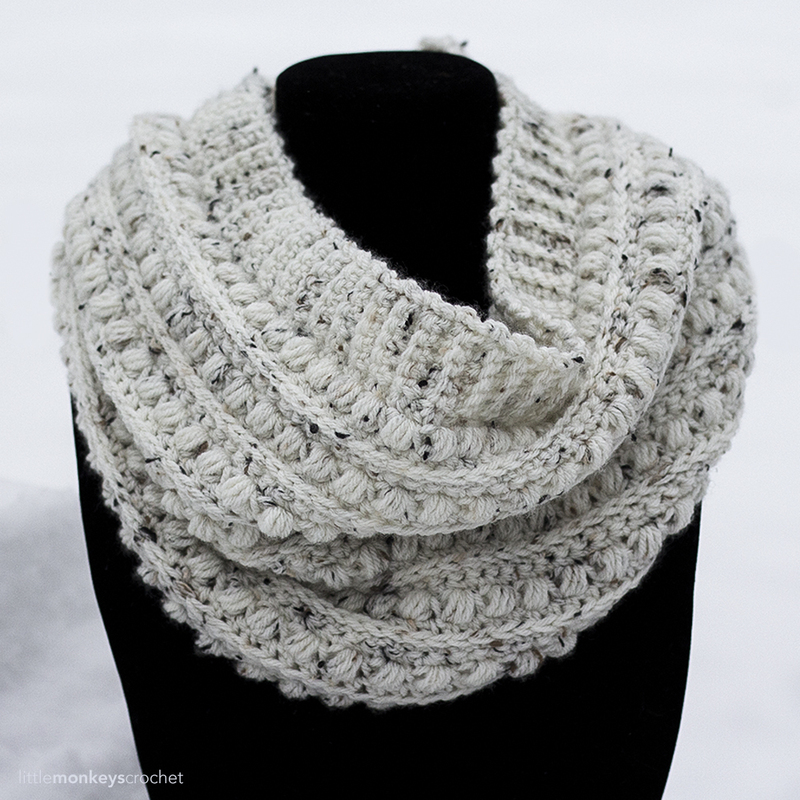 Love your patterns and have several fav’d to my Ravelry account! 🙂 Recently, came across a beautiful placemat image on Pinterest, and the link was to [sic] Joanne Fabrics & Crafts, but it was a dead link. Couldn’t find it on the JoAnn website anywhere, even in their projects area. Multiple searches on the web and in Ravelry came up w nothing. Hi Jean! The photo is a little fuzzy so it’s difficult to know for sure, but I don’t think that’s my pattern. 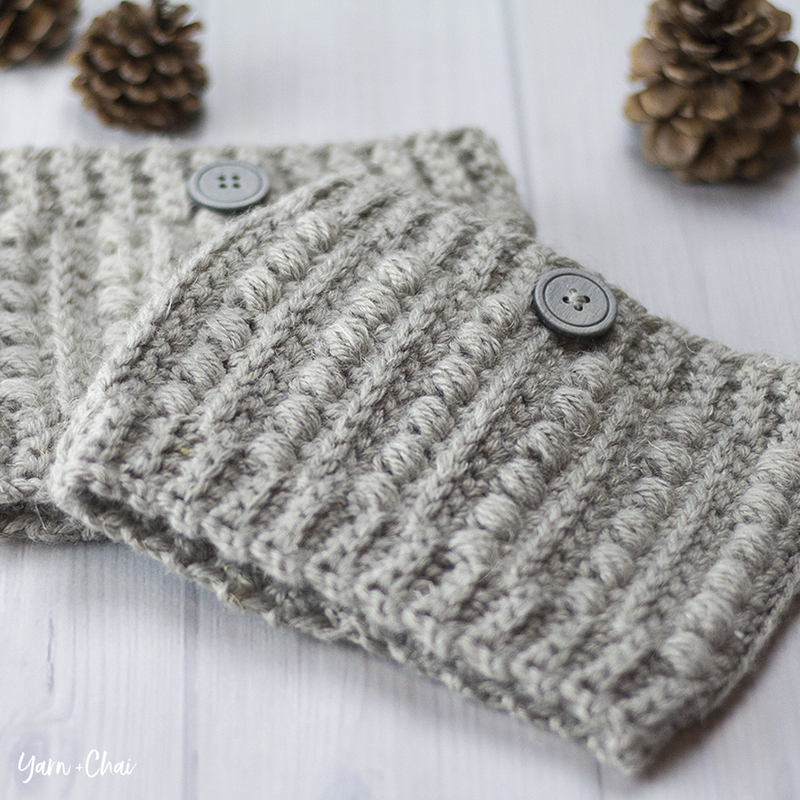 However it does have a very similar look, so if you found that pretty ombre yarn and used it with my pattern, you’d probably have a very similar result. Good luck! I’m having a problem. When you say, in row two chain one turn, HDC in first stitch, do you mean the stitch next to the chain or do you mean the second stitch from the hook. I cannot possibly make a hdc in that very first stitch. Can you tell I’m new to crocheting, HA. Sorry, if this is dumb, but I love the placemats and the yarn, and am trying my darndest to accomplish this. Thanks for trying to help, I think i resolved my issue of which stitch to go into when starting the second row with a HDC, and successive rows. To me, it’s actually the third stitch from your hook. Not the chain, and not the next loop, but the third loop ? My placemat is looking relatively close to your picture, so I’m happy with it. I guess I’m too old. I can’t figure out how to do the download. There is no download (so it’s not you!) 🙂 The pattern is written out in full in the blog post. How do these hold up after washing them?? I have little kids and things get messy and we wash our placemats about once a week. I was thinking of using just a solid color so the colors wouldn’t be a problem but do the corners come up and does the yarn get frayed? Thank you!! I have only washed mine once but I’ve washed a purse from the same yarn a number of times and it has held up wonderfully. I love these placemats, thank you for the pattern. I’ve completed the first one and finished measurement is 14 x 20. I used the same yarn and hook. I love this pattern. Thank you for sharing it. I used the Lions Brand yarn you suggested and it has been great to work with. I am doing 4 placemats and was wondering if you or anyone else has used the left over yarn for another small project. Any suggestions appreciated! Please can you doa video, to show us how to do this. Mine is coming out all wrong!!! Love the placemat. Look forward to receiving permission to use the pattern. Thank you so much. Have a great day. Beautiful table by a talented Dad for a lucky daughter. Make sure your Dad signs and dates it underneath (and the benches) as it is sure to be an heirloom for your family. Take a picture too of your Dad with the table. It will make it that much more precious for future generations and in telling the story. Your placements are a perfect and pretty complement to the table (look forward to making some for my daughter). May you have many celebrations and gatherings around it. Best wishes.